Denis Varnier is a third generation winemaker with just over 4 hectares of Grand Cru Chardonnay in the villages of Avize, Cramant and Oiry, making about 3000 cases of wine per year. The vines average 45 years of age, and Varnier Fanniere's legacy goes much further back as Denis' mother's side of the family (the Fannieres) have been growing grapes since 1860. All three vineyard holdings are in the northern Côte des Blancs, the smallest in Oiry with equal amounts in Avize and Cramant. The Avize holding includes Clos du Grand Père, a fantastic parcel with 77 year old (and older) vines. Denis micro-oxygenates the still wines so he can use less less sulfur, the Champagnes under go full malolactic fermentation, and have 15-20% less pressure than most others which may add to their silkyness (for example, my first TN, without ever reading this, said "festive silky great mouthfeel"). Varnier-Fannière Grand Cru Brut NV - Their NV basic wine. Varnier-Fannière “Cuvée Saint-Denis” Brut NV - A quite spectacular all Avize from the 77+ year old Clos du Grand Père vineyard. Tasting note below. Varnier-Fannière “Cuvée de Jean Fannière Origine” Extra Brut NV - Made in a drier and more masculine style that Denis Varnier's grandfather might have made, and their driest wine. 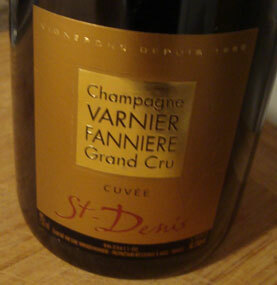 Varnier-Fannière “Grand Vintage” Brut - Typically half Avize and half Cramant. From the 77+ year old Clos du Grand Père in Avize. Disgorgement date 5/16/2012. The nose has apple, white flowers, and lots of spicy minerality & chalk with air. On the palate, there is immediate apple peel and a hint of pineapple, followed by a spicyness, lemon, and lemon cream. This has a joyous and festive silky great mouthfeel!